Gastroesophageal Reflux Disease (GERD), also known as acid reflux, is an extremely common and chronic stomach disease or digestive disorder. It is estimates that over 60 million Americans suffer from acid reflux per month. The symptoms of this condition are triggered when certain foods are eaten, but are not properly digested due to the disease. Avoiding these foods can significantly reduce the effects of acid reflux and improve your health. The Lower Esophageal Sphincter (LES), a ring of muscles below the esophagus (food pipe) functions to protect, close, and separate the stomach from the esophagus. 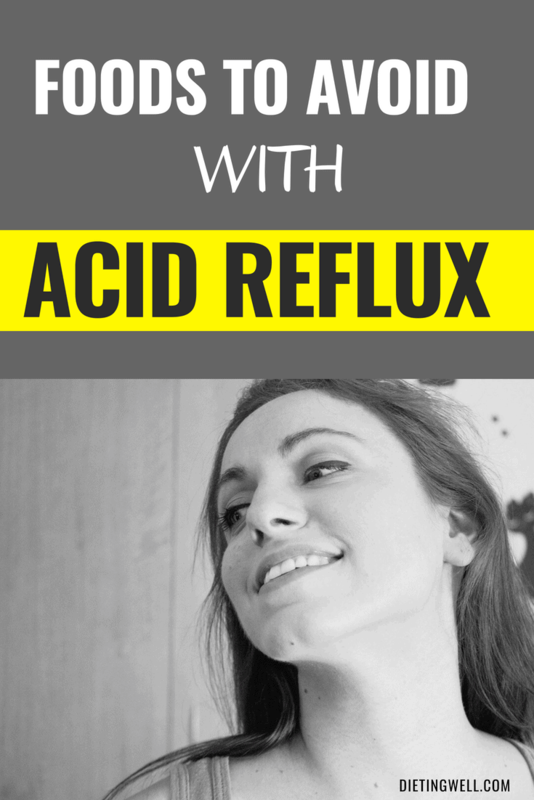 Acid reflux occurs when these muscles relax and allow acidic liquid to regurgitate and back up into the esophagus (refluxed). A reflux is more likely to occur if LES muscles are weakened or damaged. In addition to acid, the refluxed liquid may contain pepsin and bile from the stomach. These substances may inflame and damage the lining of the esophagus causing another chronic condition known as esophagitis. People with this condition experience a burning sensation in the stomach and esophagus when the stomach liquid moves back up into the esophagus. The ‘burn’ may be accompanied by chest pain and a sour or bitter taste, if the liquid reaches the mouth. Some people may experience a “wet burp” or even vomit. Heartburn and dyspepsia are two other conditions that often co-exists with acid reflux and have some similar symptoms. It is common to notice these symptoms when lying down, especially soon after a big meal or a meal ridden with substances that trigger reflux. Although acid reflux is not a serious or life-threatening condition, once a person develops this stomach disease, it usually remains a lifelong condition. If you are an avid foodie with a wide taste for food, you may be disheartened to learn that some of the foods you eat may trigger symptoms of the condition. As such, it is especially important to manage GERD by knowing what foods cause acid reflux flare-ups, so you can reduce their intake or avoid them altogether. Like other medical conditions, acid reflux can be treated with medication. A healthy diet filled with alkalizing foods that are easily digestible is a natural way to treat this condition. Meats, particularly red meats such as beef, lamb, and pork, are high in protein, but are also difficult to digest and stay longer in the stomach than most other foods. They are also high in cholesterol and fatty acids that can easily irritate the stomach and trigger acid reflux. A full stomach of meat that remains undigested for an extended period puts pressure on the LES and increases the chance for acidic liquid to rush back up to the food pipe. Leaner meats are easier to digest and should, therefore, be the preferred choices of protein for people with GERD. Deer meat, chicken, and turkey, and fish such as tuna, trout, and tilapia are sources of lean protein. This may mean you have to limit or give up on that juicy steak or yummy beef burger. On the brighter side of things, you won’t have to put up with the occasional sour food backing up into your mouth or the heartburn and sour burps. Dairy foods, for example, cow’s milk or whole milk, butter, regular cheese, and sour cream are rich in calcium and protein. Unfortunately, these high-fat foods are not friendly to a stomach affected by GERD. People who are lactose intolerant sometimes confuse their symptoms with acid reflux, but these are two distinct conditions. While grandma swore that a glad of milk was the remedy to the heartburn associated with acid reflux, you may be surprised to know that milk cause the stomach to secrete excess acid. This in turn increases the risk for acidic liquid to flow back up into the food pipe. Good alternatives to whole milk are low-fat or non-fat milk and milk made from plants products such as soy, almond, rice, or cashew. As much as grains form a large part of the staple diet for many people, certain grains trigger acid reflux due to their high acidic content. These grains include white rice, wheat, corn, and rye. Eating them in smaller portions can help reduce your symptoms, or you can choose healthier alternatives such as quinoa, brown rice, barley, oats, and buckwheat. They are higher in alkaline, a substance which helps to neutralize acid in the stomach. Their high-fiber content also makes them preferable for promoting digestion and reducing the chance for the stomach to push back food and liquid it was unable to digest. Fatty foods include naturally fatty foods and foods fried in fats and oils. In general, fatty foods cause the LES to become relaxed and opens the stomach allowing liquid to slip back upwards. Besides fatty red meats, consuming foods that are naturally filled with fatty acids may aggravate the symptoms of this stomach disease Some foods naturally high in fats are bacon, ham, lard, certain cooking oils, avocado, and peanut butter. Although peanut butter is high in protein and good fats such as monounsaturated fats, too much of it is bad for a stomach affected by acid reflux. Then there are fried foods. There is something about fried foods that make you crave for them, and you still can’t seem to get enough of the fat and grease that come with these unhealthy foods. From the beloved French fries and onion rings to fried chicken from your favorite fast food joint, eating these foods while having acid reflux disease is like begging for a steady bout of stomach discomfort. Not to mention the burning sensation that makes you feel as if there is a fire on the inside of you. Like fatty meats, fried foods are heavy and place pressure on the LES. They also take longer to digest because they are usually high in saturated fat and trans-fat. These unhealthy foods, riddled with unhealthy fats, are also high in cholesterol. Limiting the total daily fat intake from all sources to about 25% of the daily value is a good way to keep acid reflux symptoms in check. Hello, spicy food lovers! Here is some heartburning news. Spicy foods are notorious for provoking the symptoms of acid reflux and even making the condition worse. This is because they contain a substance known as capsaicin which slows down the rate of digestion and cause food to remain in the stomach longer. Spicy foods include natural spices such as chilli pepper or chilli powder, black pepper, and raw onion, and garlic. These foods tend to alter the levels of stomach acid. They further increase the risk of heartburn associated with acid reflux because they irritate the esophagus which is already inflamed. Relax spicy food lovers. No need to stress the loss of your spice. You can still keep the ‘spice’ in your life in ways other than consuming a heavy dose of spicy foods that is, obviously, an enemy of your lower esophageal sphincter. Citrus fruits and juices made from them are rich in citric acid. They have a high fiber content and are excellent sources of vitamin C and other minerals. Examples of these fruits are oranges, limes, lemons, tomatoes, and grapefruit. Eating a small portion of these citrus fruits is usually enough to meet the recommended daily intake of fiber. However, consuming these fruits and juices actually increase the level of acid in the stomach causing a negative impact on the esophageal pH levels. If you want to reduce the symptoms of acid reflux, you can achieve this by decreasing your intake of highly acidic fruits or avoiding them. Naturally, you may want to turn to other fruits. However, some other fruits can be just as acidic as citrus fruits. They include apples, grapes, pineapples, pomegranates, prunes, and plums. Also on the list of foods to avoid if you are someone who suffers from acid reflux are onions, garlic, tomatoes, and mint. Onion is a spicy vegetable that some people love to eat. Some even eat onion raw. For people affected by GERD, raw onion especially burns in the throat and the stomach immediately after eating it. Once in the stomach, it relaxes the lower esophageal sphincter and cause a reflux. Belching is also common after eating onions which further aggravates acid reflux symptoms. This is because onion contains fermentable fiber known to be associated with digestive issues. Tomatoes are filled with gastric acid which when eaten increases the level of stomach acid. Having nowhere to secrete the excess, the stomach pushes it back to the food pipe. Garlic is a good anti-inflammatory food and has other nutritional benefits. But it also triggers heartburn linked to acid reflux. Similarly, mint such as spearmint or peppermint used in tea or gum should be avoided. It causes heartburn that irritates the esophagus. Carbonated beverages, such as sodas, contain caffeine and are infamous for igniting that burn in the stomach and esophagus. Consuming these beverages is linked to an increase in nighttime heartburn episodes, particularly if they are consumed while taking certain prescription medication. When these drinks enter the stomach, the carbonated bubbles expand and place increasing pressure on the sphincter that results in a reflux. Carbonated sodas are also high in acid. Drinking one can of soda can increase the acid level in the stomach for almost 1 hour while distending the stomach twice as much as when you drink water. Since caffeine is also known to trigger a reflux, imagine the impact of drinking beverages that are carbonated, caffeinated, and acidic all at once! Chocolate contains substances and compounds that relaxe the muscles of the lower esophageal sphincter, causing stomach acid to revert back to the throat and mouth. These substances include theobromine and caffeine. Chocolate, especially dark chocolate, also contains the hormone serotonin (said to give a ‘happy’ ‘feel good’ sensation) that can have a similar effect on the LES. Cocoa is also naturally acidic and further increases the risk of aggravating the symptoms of acid reflux. The implication of this finding may mean that you will have to kiss your chocolates goodbye or avoid them as much as possible. Perhaps, it may be better to have one square of sweetness at a time, spaced out enough to reduce the effects of chocolate on the protective stomach muscles. The risk of heartburn and increased acid levels in the stomach is greater when alcohol such as beer and wine are consumed. Mixing alcohol with soda or acidic juices such as orange juice is like a double whammy. Excessive alcohol can destroy the lining of the esophagus and increase the severity of the burning sensation felt when acidic liquid backflows. Avoiding alcohol, straight or mixed, may, therefore, put your sphincter muscles as ease. Like chocolate, coffee is made from cocoa which contains caffeine. This means you may have to ditch your coffee-drinking habit if you have acid reflux. Caffeine is known to stimulate the secretion of acid in the stomach and cause relaxation of the LES, thus allowing liquid from the stomach to escape. The frequency and severity of reflux symptoms tend to increase after drinking coffee, especially in large amounts. The risk of aggravating the symptoms is higher if coffee is ingested after a meal. Drinking decaffeinated coffee or avoiding it altogether in favor of tea, may be a great alternative way to keep your stomach happy. Now that you know that these 11 foods may be the reason why you have recurring episodes of acid reflux symptoms, it may be time to change your diet and even your lifestyle. Doing so can greatly reduce the symptoms of this stomach disease and improve your overall health. Imagine if you quit drinking that glass of whole milk, especially on a full stomach right before bed, or snacked on a few squares of delicious dark chocolate at nights. As enjoyable as these foods taste ‘going down,’ they don’t taste so pleasant coming back up once your symptoms are triggered. Although gastroesophageal reflux disease is very common among Americans, it does not have to interfere with your health or overall quality of life. Fortunately, significant relief is possible if you manage your diet and lifestyle. Even if you were not aware that foods you love to eat are the culprits triggering your symptoms of acid reflux, you can still make the changes to improve your health. Avoiding these foods that were discussed and choosing those that contain more alkaline can promote digestion and reduce the episodes of acid reflux.